Montana Wildlife Gardener: What is a weed? Kate, The Manic Gardener, recently commented on Ecology of Quaking Aspen, and questioned whether planting quaking aspen would be akin to inviting tree-sized weeds into the yard. This got me thinking about "what is a weed". Town Mouse/ Country Mouse had a similar post recently on terminology and I thought I would add to that. Here I will try to briefly define some common terms. A “weed” is any unwanted plant. This is a totally subjective term that refers to someone’s arbitrary goals and objectives. What is a weed in my lawn might be a wanted plant a few feet away, and vice-versa. I have several plants in my garden that many gardeners consider weedy. What is weedy to some may be hardy, drought tolerant, and easy to grow to others. Pictured in this post are Wood’s rose (Rosa woodsii), showy milkweed (Asclepias speciosa), Missouri goldenrod (Solidago missouriensis ), and white yarrow (Achillea millefolium), all Missoula area native plants, and wonderful for wildlife. All are drought tolerant, and easy to grow and all are considered weedy. Wood’s rose, quaking aspen (Populus tremuloides), milkweed, fireweed (Chamerion angustifolium) and goldenrod are often considered weedy because they spread with shallow rhizomes or runners. If you are uncomfortable with their tendency to spread, you can be control this tendency by planting them in an open-bottomed pot, surrounding them in a garden bed with lawn edging, or like I do, by digging them up and potting them to move to other areas of the yard. Almost anytime in the summer I have potted aspen, goldenrod, rose, milkweed and others awaiting a new home. There are some plants in our yard that I do consider weedy and I spend a bit of time reducing their numbers, but I am not so concerned that I want to get rid of them. Rather I like to manage how many I have. In our garden the plants I consider weedy are bluebunch wheatgrass (Pseudoroegneria spicata), the Montana’s state grass, and blue (or prairie) flax (Linum lewisii). Periodically I dig up the unwanted ones and pot them for other people (the liberated bluebunch is especially enjoyed by a wonderful landscape architect friend of mine). Having these "weeds" is not really the end of the world. We do have a lot of plants in our yard that are excellent "volunteers" that gladly spread around the yard. Some might find this annoying and "weedy," but I completely enjoy it. Plants in this category include rubber rabbit brush (Chrysothamnus nauseous), false lily of the valley (Smilacina stellata), Canadian white violet (Viola canadensis, pollinated and spread by ants), showy fleabane (Erigeron speciosa), hairy golden aster (Chrysopsis villosa), thimbleberry (Rubus parviflorus), or even blue-eyed Mary (Collinsia parviflora). I look forward to my spring routine of carefully digging up wayward false lily of the valley and canaidan violet runners and potting them up. They root so quickly that ususally in a week I can transplant them or give them to friends. Also, stray blanket flowers (Gaillardia arristata), showy fleabane, and Wilcox's penstemon (Penstemon wilcoxii), frequently invade my little patches of lawn. These, too, I carefully dig up and pot for transplant. This is how we get most of our plants now- from other areas of the yard. I have my a eye on a bunch I want to pot up now, I just need for some snow to melt and the ground to thaw! In this country, “native” is typically defined as a plant that was here prior to European establishment, and was not transported or introduced by humans. Obviously, the big thing with “native” is scale, and this is where subjectivity comes into play, because often a species' “nativeness” relies on an artificial, arbitrary, political boundaries. For example, “Montana native" quickly loses meaning when you think of the wide variety of elevations, habitats, climates, plant communities and topography of this state. Western red cedar (Thuja plicata), for example, is native to the damp, shadowy forests in extreme western Montana, but is not appropriate to the prairies of eastern Montana, even though it is native to Montana. 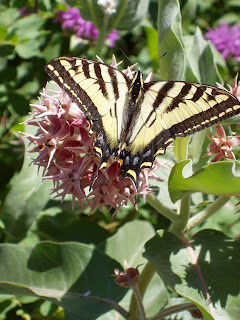 That is why in our garden we use plants that are not just native to the state, but native to the immediate Missoula area. Using locally native plants, we do not have to water them, and they attract a variety of insects and animals to our small yard. There are many native genera that have been cultivated for use by gardeners- these are called "cultivars". A cultivar is a plant that has been selected and bred for specific traits. The unfortunate thing I have found is that many nursery workers do not understand these distinctions. Many well-intentioned gardeners, have returned home with plants they purchased that they thought were native, but were cultivars of native plants often bearing little resemblance to their native cousins. You often see pink yarrow (Achillea spp. ), enormous bunches of blanket flower (Gaillardia spp. ), all sorts of juniper (Juniperus spp. ), hybrid penstemons, assorted spireas, and different colored potentillas, in the native sections of nurseries. And althogh the genus is native, the plants are not. The problem with cultivars are many; ranging from conservation issues to wildlife and site appropriateness. If the cultivar were close enough to the native speices, and you lived in the vicinity of the native species, they could hybridize and this could be a conservation issue. On the other end of the spectrum , if the cultivar is too dissimliar to the native plant, the timing of the bloom, emerence, fruiting or of the aspects could be so foreign that it is not very useful to native insects and other animals that use and rely on the native. Finally, the cultivars are typically bred for traits that might suit a wide range of habitats, allowing them to be sold all over the west or the country. These generic traits might no longer match the conditions found in your yard or in its native locale. When procuring native plants, try to find the most "native" native plants you can, and this could take some doing, but it is a fun and rewarding endeavour. It usually does not require you to collect seeds and grow all your own plants for yourself. That is, unless you were looking for an excuse to do that. An "endemic" plant is one that has a very limited geographic area or region. Physical, climatic and biological factors can contribute to endemism. Endemism can arise in two ways, either from a shrinking range, called paleoendimism, or more commonly as a result of reproductive isolation that leads to speciation or the creation of a new species. Because of their inherent limited geographic distribution, endemics can easily become threatened, endangered or extinct. Endemic species are prone to manifesting themselves on islands - either literal or figurative-because of geographic and reproductive isolation. In Montana, we have few endemic animals, though a couple of noteworthy endemic plants, including the Missoula phlox (Phlox missoulensis), which is limited to a small area- a relic of alpine habitat on a windswept ridge above Missoula. "Wild" or "naturalized" is not the same as native. These terms refer to a plant or animal that is introduced and is doing quite well on its own- "feral" for lack of a better term. These species are reprodiucing and sustaining a population without the help of humans. Often these terms are used to describe non-native plants or animals we have given up on trying to control. Many confuse naturalized with native, and in many parts of the country (California and the east coast of the US, for example), few know or remember the native plant communities because of generations of human-induced changes to the flora. "Exotic" or "non-native" refers to a speices that is originally from outside a particular area. This does not imply it is "invasive" (see below), and can represent anything from a plant native to somewhere else in the US, or one native to Asia. Tomato plants are exotic or non-native to North America, but they aren't really a conservation threat. They do not escape and become wild or naturalized. On the other hand, some exotics do become invasive, and that is where the real problems begin. Invasive plants, which are usually non-native, become a nuisance, displace of native species, and spread and become eastablished quickly. Invasive species you may be familiar with include leafy spurge (Euphorbia esula), yellow star-thistle (Centaurea solstitialis), and kudzu (Pueraria montana), just to name a very few. The good news about exotic or non-native species is that very few introduced plants and animals become invasive. This is really good since thousands of species have been introcued to this country and continue to get introduced, annually. The bad news is that the few invasive species we do have in this country are cuasing significant ecological and econonic damage and in many cases they will never be eradicated. "Noxious" is a legal term defining a plant designated by state or federal agricultural agencies as ones that are injurious to "agricultural and/or horticultural crops and/or humans and livestock". Noxious weeds are required by state or federal law to to controlled. Many invasive plants, and many noxious weeds, were intentially introduced as ornamental plants in garden settings and have since escaped. A few famous examples include Dalmatian toadflax (Linaria dalmatica), purple loosestrife (Lythrum salicaria), and salt cedar (Tamarix ramosissima). This is where you have to consider your plant selection and the effects or your own small garden in the environment. Another good reason to garden with native plants: if they spread outside your yard, they are just returning from whence they came, they will not wreak havoc on your local ecosystem. I was recently asked by a journalist writing a story about planting native shrubs and trees for birds if there were any Montana native plants that were noxious weeds. The answer is no. For a list of Montana noxious weeds and other information click here . Hi David, great post and a good perspective. I too try to control how many I have rather than if I have them. Lord knows I have made some mistakes introducing some things to my garden but keeping them manageable isn't as difficult as some of my other friends seem to think. A weed to me is just a flower that needs to be moved, sometimes that is to the compost bin. Great info. At MG class we learned that weeds are any plant that didn't serve a purpose for you in your landscape. For me, it's Globe Mallow. It comes in Wildflower mixes for our region, and most people love it, but this stuff grew everywhere on our farm when I was a kid and my dad told me it was a weed, and I've never lost that belief. I pull it up if it shows up in my garden. Well, that's certainly very thorough and shows the difference between a wildlife biologist and a mouse. Thanks so much! BTW, I'm having trouble getting Asclepias speciosa established so far. But I put in 3 more plants last fall, we'll see what comes back. Thanks for your comments and thanks for some great recents posts on your site. Great points about native plant myths- just take a look a my post about the Felco pruners- native plants do require maintinence. I haven't ever had a problem getting milkweed going, are you trying to grow from seed or from the runners? I really appreciate that you always mention the botanical names of the plants. For an non-American, non-native speaker of English, English names can be quite confusing. I was surprised to read that Achillea millefolium is native in America too. I always considered it as a herb typical for the Eurasian continent. Ja, veel voorkomende namen zijn verwarrend. Dat is interessant over de Achillea, ik wist niet dat hij groeide in Europa, ook.